* If you are sculpting and using more than 5 lbs. of Plastilina, moist clay or other sculpting medium, an armature is a must-have to act as an internal skeleton for your piece since the clay cannot support itself. 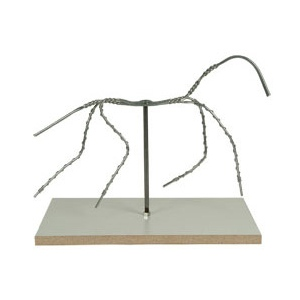 * Our 8" - 10" animal armature serves as this support framework; it is a horse-shape since most animals have this basic form. * Made from non-staining, non-corrosive, aluminum wire with a backiron made of sturdy steel, our armature is strong yet pliable. * The steel backiron is fixed and attached to a base made of formica over heavy gauge plywood. If using moist (ceramic/pottery) clay, please note, the armature cannot be put in a kiln during firing. The clay will shrink but the wire will not, resulting in cracking and/or breakage. We suggest using a wet and twisted newspaper armature as the paper will burn off during firing; or a wax armature as the wax will melt during firing.